The home that an architect or designer chooses to inhabit often becomes a living laboratory, a place where trends are tested and universal principles are employed in innovative new ways. Frank Lloyd Wright had his home and studio. Designer Sharon A. Harvey has her gentlewoman’s country house on 222 Onwentsia Road, situated on a historic parcel of land once belonging to the McCormick Estate. Over the last two decades, she and business partner, David J. Poulton, AIA, have renovated the 1957 property with impeccable attention to detail. 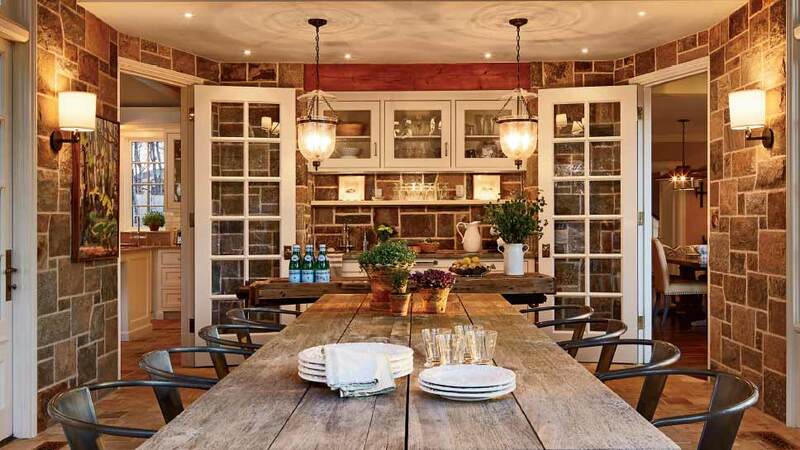 In a similar spirit of Architectural Digest’s annual “American Country House” issue, the home is a lady’s version of a “gentlemen’s farm,” complete with granite brought in from New England and organic flower gardens that come alive in springtime. Harvey, who has served in various capacities on the Lake Forest Preservation Foundation, Lake Forest Open Lands, and Ragdale Foundation, is considered a local expert for those seeking to determine architectural and artistic significance of a home in the community. In addition to her design work at The Poulton Group over the last 30 years, she has also been recognized for her contributions and educational outreach initiatives to preserve the architectural and historical legacy of Lake Forest and Lake Bluff. But what happens when the resident expert turns attention to her own home? We were excited to get a first-hand look at what can only be described as a labor of love—a whole house renovation that evokes another place and time in history. She wanted all the spaces to be warm and inviting, with good circulation. Lines between the inside and outside would be blurred. And every room would have purpose and function, including a dining room that also functions as a library. As a personal laboratory, the project gave Harvey the opportunity to try new things and overcome challenges in unique ways. Blending the indoor and outdoor spaces was important, but how is that done without interrupting flow and efficiency—especially in climates such as ours with cold, harsh winters? The greatest design and architectural feat of this project is emblematic of what Harvey and The Poulton Group do best—employing Greek and Roman principles of proportion and balance. While technically a renovation, the bulk of the project is new construction. A cedar shingle roof was replaced with slate and red brick was changed to stone. The original attached garage was carefully dissected and lifted by two GPS leveling cranes onto a new foundation towards rear of the property and now serves as a highly functional detached shop building and studio, which The Poulton Group will be submitting for LEED certification. The result is a stunning example of what Harvey calls a “legacy home,” a place that evokes a different era and incorporates the highest quality of detail and craftsmanship. Having worked on renovations of historic landmarks by the likes of architectural legends David Adler, Howard Van Doren Shaw, and Harrie T. Lindenberg, Harvey says the authenticity of her country house was very important. 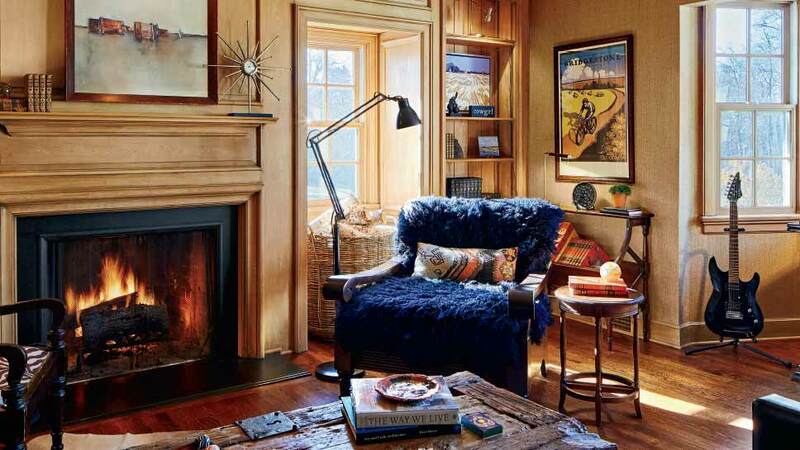 Harvey designed this study as a place for the family to disconnect from technology and reconnect with one another. 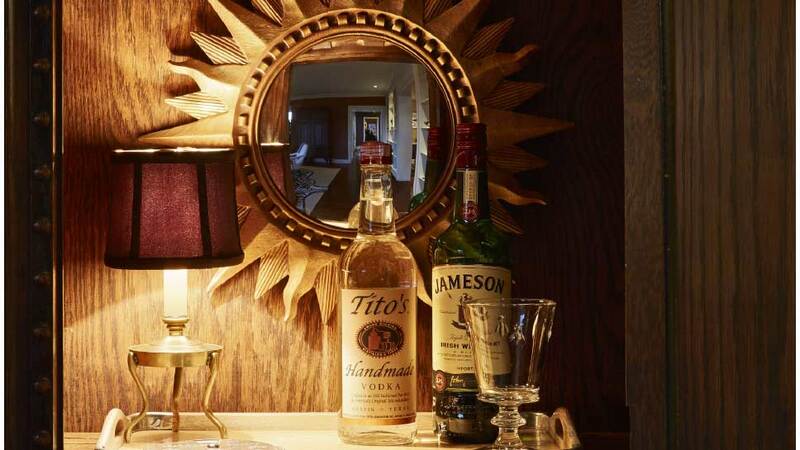 Details such as this armoire refashioned as a liquor cabinet add dramatic flair. Gorgeous photos of a stunning home! A marvelous person with insurmountable talent. Fantastic article. Congrats Sharon (and David)!